Notes: Power brick for powering Pods. One power brick can power up to 10 typical Pods. Pods can be daisy-chained using a Barrel Cable or Long Barrel Cable. 15V/3A (45W) / 2.1mm Barrel Plug (5.5mm outer diameter) / Positive Centre. Notes: 2.1mm barrel plug (5.5mm outer diameter). Longer barrel to barrel cable for daisy-chaining Row Powers and/or Pods. Cable is 10" long, suitable for connecting Row Powers across an entire 3U (for example connecting a Double Modular Row 6U to another Row Power). Also suitable for two Pods that have a bit of space between the enclosures, or for connecting a Row Power and a Pod. Notes: For use with the CR6249A Keepsake turntable. 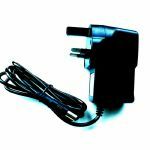 Notes: UK Mains 9 Volt Power Adapter suitable for Crosley Cruiser, Crosley Executive or Crosley Player Record Player. 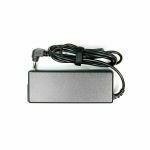 If your Crosley Record Player was supplied without a UK Mains adapter, this replacement UK mains adapter will get you up and running in no time. Danelectro's vintage batteries offer superior tone to most pedals. 4 x 9 volt outputs. Quick battery change with easy open lid. "Kill switch" cuts power to all 4 DC outputs (no need to unplug input cables from pedals). Includes 4 DC cable, 4 Danelectro 9 volt vintage batteries. Small footprint. Feed your pedals something they like! Notes: A 4 socket extension reel with integrated carry handle and overload cutout with reset button. Maximum current when used fully wound is 5 A. Maximum current when used fully unwound is 13 A. Notes: A Red and Black 4 socket extension reel with stand, carry handle and over heat protection. 4.4 A maximum current fully wound, 13 A maximum current fully unwound. Notes: With these power split cables, it is easy to distribute the power from an AD-9 to more than one pedal. The new design introduces flat contacts (similar to the popular EBS flat patch cables) to further reduce space on your pedalboard. Notes: Power split cables make it easy to distribute the power from an AD-9 to more than one pedal. These split cables are available in one-to-two, one-to-four or one-to-six (DC-2, 4 or 6) configurations. Notes: One to four configuration. With these power split cables, it is easy to distribute the power from an AD-9 to more than one pedal. Notes: One to six configuration. Notes: Elektron power supply, compatible with Model:Samples. Comes with selection of plug connectors. Notes: 10-pin to 16-pin 25cm Eurorack ribbon cable. Notes: iConnectAUDIO2+ can normally be bus powered by a computer attached to USB Device port 2. However this external power supply is required for optimal operation with iOS devices. Notes: PSU for IK Multimedia iRig Mix mobile mixer. Notes: Strom Mobile is a portable power solution for music makers and everyone who needs reliable voltage source at all times! 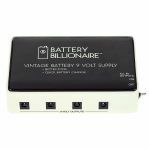 The Strom Mobile transforms the output voltage of USB power banks (5V DC) to either 9V or 12V DC to power any (music) device running on those voltages. There are two independent channels which can output individually set voltages. The Strom Mobile includes an input current feedback system to save the user from exceeding the maximum output current of the USB powerbank in use. Notes: Schuko plug/Type F power cord for the Make Noise 7U Steel CV Bus Case, suitable for many countries in Europe. Notes: Official PSU replacement for Make Noise 0 Coast - contains 5 interchangeable plug types. Notes: Power supply for Make Noise Skiff cases. Model VEC40US15. Notes: Plug-in power supplies giving a fixed AC output voltage. Notes: Plug in adaptor that allows equipment fitted with a European Schuko plug to be used in a UK mains outlet. Notes: 10-socket multi-plug power adapter - sources 10 sockets and is housed with a black aluminium casing. Ideal for extension cables and events that require more than 1 power source. Notes: Mooer Mary Chain power supply link taking the regulated power supply to two or more effects pedals in your line-up. Notes: Mooer Stage Power Supply PDNT9V2AEU makes the ideal accessory for powering your favourite Mooer guitar effects pedals. Mooer Stage Power Supply PDNT9V2AEU can deliver up to 2 Amps at 9-volt (DC) 2 and features a pedal board style design. PDNT9V2AEU power supply when used with either the "Power Cable Daisy Chain" PDC-5A (for 5 x pedals) or the PDC-8A (for 8 x pedals), can drive up to eight Mooer FX pedals. Notes: Mooer Stage Power Supply PDNT9V2AUK makes the ideal accessory for powering your favourite Mooer guitar effects pedals. Mooer Stage Power Supply PDNT9V2AUK can deliver up to 2 Amps at 9-volt (DC) 2 and features a pedal board style design. PDNT9V2AUK power supply when used with either the "Power Cable Daisy Chain" PDC-5A (for 5 x pedals) or the PDC-8A (for 8 x pedals), can drive up to eight Mooer FX pedals. Notes: The MACRO POWER S12 from MOOER is a high output professional pedalboard power supply. Sporting 2 toroidal transformers and 12 completely independent outputs the MACRO S12 can deliver up to 3.4 Amps (3400mA) of clean, quiet and consistent DC power for all of your pedal power needs. All of this is crammed into a tour ready metal housing and comes packaged with all the cables you need to get up and running. Notes: Mooer Stage Power Supply PDNT9V2AEU makes the ideal accessory for powering your favourite Mooer guitar effects pedals. Mooer Stage Power Supply PDNT9V2AEU can deliver up to 2 Amps at 9-volt (DC) 2 and features a pedal board style design. PDNT9V2AEU power supply when used with either the 'Power Cable Daisy Chain' PDC-5A (for 5 x pedals) or the PDC-8A (for 8 x pedals), can drive up to eight Mooer FX pedals. Notes: The MW Step Down Voltage Converter Adapter allows 110V-120V appliances to be used in 220V-240V countries. It featues 2-pin input and 3-pin outout; and it is suitable for appliances up to 45W. Notes: This power supply adapter is suitable for AE modular and other devices. The maximum current of 1.3A is enough to feed several AE modular racks in parallel. 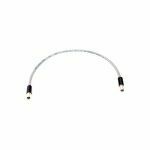 Notes: This extender cable is useful if you use the power splitter cable; the length of 1m allows it to arrange your devices as you like and still have them powered by one single power supply. Notes: The Power Splitter Cable allows it to power up to four devices with one Power supply adapter. The PSU you find here has enough capacity to run up to four AE modular racks (or other devices with 9V supply voltage). Please make sure the total current consumption is below 1.3 amperes! Recommended if you use extender cables, as the four cables of this splitter are only 20cm in length each.